Are Chef Joël Robuchon's Latest Restaurants His Best Yet? With three new hotly anticipated restaurants to his name—two in New York and one in Miami—chef Joël Robuchon is burning it. Let’s examine the evidence. 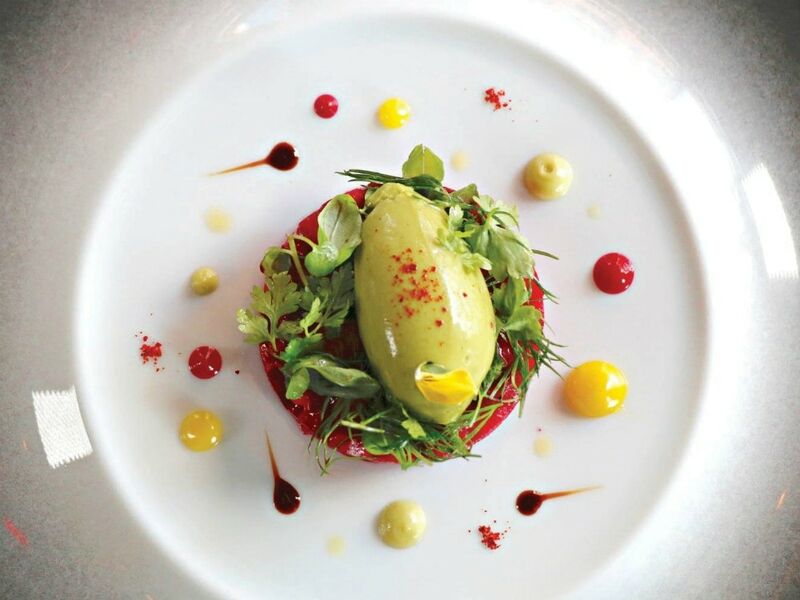 Chef Robuchon's La Betterave with beet, apple avocado duo, and green mustard sorbet. Chef Joël Robuchon (joelrobuchonusa.com) opens not one, but two restaurants in New York City simultaneously, both with extremely dierent styles. L’Atelier de Joël Robuchon in the Meatpacking District has a more casual vibe with a cool counter concept and a dual space. Then Joël Robuchon, his fine dining concept, set to open sometime this year at One Hundred East Fifty Third Street, one of Aby Rosen’s highly anticipated luxury residential projects. Located at 85 10th Ave. in the reinvigorated Meatpacking District, just below the High Line, L’Atelier de Joël Robuchon is designed by renowned French architect Pierre-Yves Rochon, who designed both the Four Seasons Georges V in Paris and the Savoy Hotel in London. The space stays true to L’Atelier’s original Parisian roots while taking inspiration from its surrounding neighborhood—expect brick walls, steel columns and expansive windows overlooking Chelsea Market. Signature counter seating ensures the restaurant will be divided into two distinct dining experiences. The front will house Le Grill de Joël Robuchon, a casual 56-seat bar and lounge with salads, sandwiches, and simply prepared dishes that will start at lunch and extend through the evening, and then a more formal 34-seat counter and two private dining rooms inside L’Atelier de Joël Robuchon. Joël Robuchon’s formal dining restaurant at One Hundred East Fifty Third will also have two parts. Designed by British architecture firm Foster + Partners, the restaurant will be on the second level. His eponymous establishment joins the chef’s acclaimed restaurants in Las Vegas, Macau, Singapore and Tokyo—all three-Michelin-starred properties. The chef is set to open a L’Atelier de Joël Robuchon in Miami’s Design District in spring 2018. The L’Atelier will be the Floridian version of the chef’s groundbreaking concept, which first opened in the Paris neighborhood of Saint-Germain in 2003. It will be broken into four venues: L’Atelier, Le Grill, Le Sushi, and a café and bakery concept La Boutique. This will be the 13th L’Atelier in the portfolio. The French chef is the most decorated toque in the world and has accumulated 32 Michelin stars worldwide. He was dubbed chef of the century by the guide Gault Millau and also awarded the Meilleur Ouvrier de France (France’s best craftsman) in cuisine. He has restaurants around the globe—both Ateliers and the fine dining establishments in Las Vegas, Monaco, Macau, Tokyo, and Singapore.